HissTank › G.I. Joe Kre-O › Geewunner Custom Arctic Attack Pre Order Is Now Live! Geewunner Custom Arctic Attack Pre Order Is Now Live! You can buy each piece individually, or get the entire set and not only save but get free shipping as well! Read on below for full details on each set, then join us after the break for discussion already in progress! First up is the Explorer Team Dog Sled. We’ve ignored the Explorer Team too long, and we do have plans to bring you more from that world, but for now, we thought this set had great potential for crossover to the world of Heroes Vs. The Enemy. Some of you may have customized a certain Inuit mercenary, and he needs a ride, doesn’t he? This set is small, but packed with play value. Not only does it include the built-up sled (plus cargo) and a team of huskies to pull it, your driver will benefit from the inclusion of a fur-lined red hood, snow shoes, and a whip. Next up is our first original set in quite a while. The Arctic Missile Attack Trike was designed in the spirit of early-80s G.I. Joe small vehicles and/or battle station packs. It includes a Lego trike that’s dressed for battle, as well as a built-up trailer that folds out to become a rocket-lunching radar station! The radar tower swivels 360, and includes four removable BrickArms rockets, as well as a removable control station. There are also clips on the trike to hold your driver’s gear! It’s a fun little set, but don’t take our word for it, check out twitziller’s pro shots! A while back, we let the Attack Snowmobile run out of stock, because we anticipated this re-release. The Attack Snowmobile 2.0 features many redesigned cues and improvements over the original, such as a more toy-accurate tread pattern, bigger, more accurate front skis, an offset front intake, a towball to allow it to tow certain Geewunner trailers, removable ice hammers that double as rollbar handles, better gear attachments to hold more minifig gear near the rear (how’s that rhyme for your ‘ear’? ha! ), and we even thought to add a wink to the original toy’s twin grey tabs out front. You can actually move these tabs just the slightest bit, so have fun pretending that it ‘steers’! All around, a much-improved Geewunner favorite. Next is an ‘arctic’ recolor of the Towed Missile Launcher. This was done up to match the Arctic Fast Attack Tank (more on that in a bit), creating a sort of arctic version of the Missile Attack Group, but this time the sets are offered separately. Plus, you may want to reassign this set to the Heroes, and not be limited by our intentions. Your call, soldier! Of course, this version retains all of the features that all previous versions included. Now it’s time for some real fun. We were originally looking to include with this wave a simple white recolor of the All-Terrain Scout Vehicle. However, after taking more looks at the modern FOE Striker, we were pressed to attempt a facsimile to that toy by adding as much similar gear as possible. It’s still white, not grey, so you can think of the Arctic All-Terrain Scout Vehicle/Outpost as a cold-weather version of that setup. You get the full vehicle – slightly redesigned and updated, including the twin machine guns (positionable!) 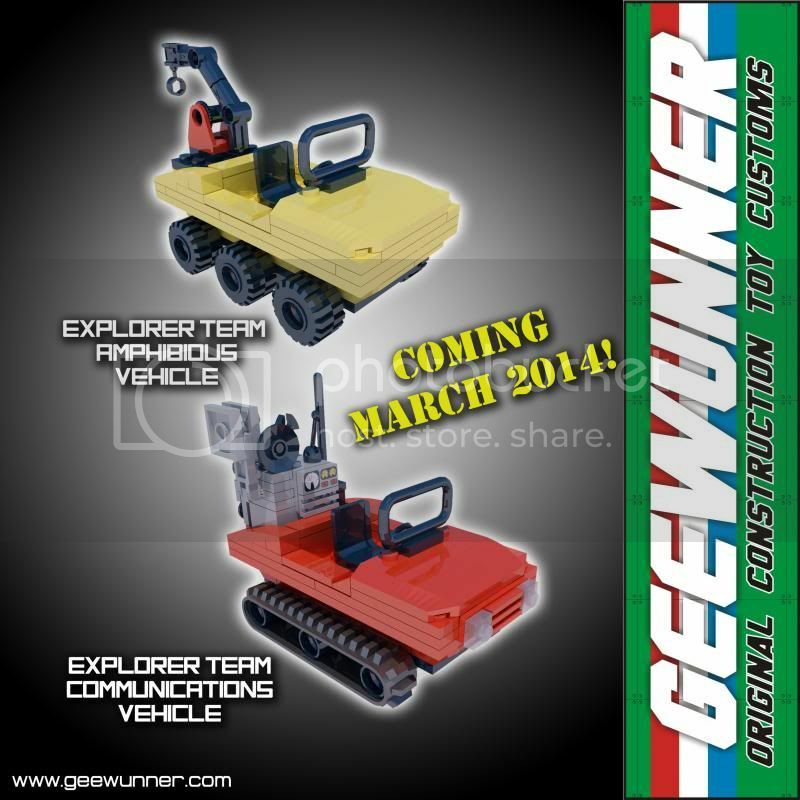 from BrickArms – plus the platform base of the outpost, which attaches to the rear of the vehicle, a rotating and positionable cannon that can be attached to the platform or the roof of the vehicle (in two different ways), and two poles with clips that hold up the cloth encampment covering. This is another Geewunner-sourced part, made from simple felt, that adds play value to this set. Roll it up, and store it on the vehicle thanks to the two minifig whips included. Roll it out, attach it to the poles of the platform base, and you’ve got a temporary encampment! You’ll have tons of fun having your minifigs interact with all of these accessories and features! 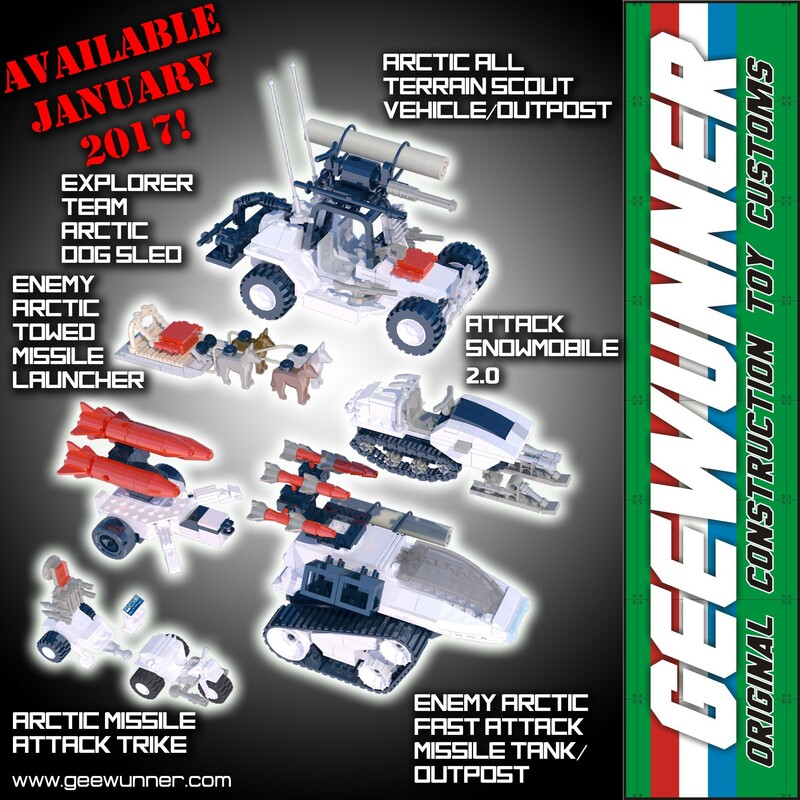 Now that we’ve worked our way up, we can discuss the marquee set of this wave – the Enemy Arctic Fast Attack Tank/Outpost! This set has been requested by many of our followers for some time, and it was always a bit of an eventuality. Well, here it is! We’ve attempted to match the original toy, including the white paint job, black storage rack, and a retooled weaponry system – a missile rack very similar to the Enemy Attack Vehicle. But like the previous set, we’ve also worked it out so that the encampment roll is not just for show, but fully operational! It functions in virtually the same fashion as the All-Terrain Vehicle‘s version, but is comprised of a felt roll of different size and color. See the photos for more visual information on how this feature works! The only catch with this set is the necessity of including dark grey fins for the rockets, as Lego doesn’t make them in red. But as we’ve suggested before with other sets in the same situation, if you’ve managed to stockpile red Kreo versions from Scrap Iron or Ghoststriker sets, you can switch them out for a more accurate look. That’s it for the six new or redux sets. Now, we have good news on a relaunch. For this preorder only, we’re offering up our previously retired Arctic Attack VTOL, an homage to the recent white Sky Hawk. So if you’ve missed it on the past, or if this theme’s many offerings still aren’t enough, you can pad out your cold-weather forces with this icy bird. Okay, we’re STILL not done. We’ve got for you a pair of new arctic-themed minifig accessory packs. First is the Arctic Mission Accessories pack, which isn’t intended for any particular character, but rather meant as a general issue gear set to help you dress up any character as a cold-weather version. It includes a build-up backpack, white BrickArms helmet, and Lego snowshoe/skis. Secondly, we have the Arctic Jetpack accessory set, an all-white version of the previously available versions. And don’t forget any of our past offerings that fit this theme. We still have some stock of the soon-to-be-retired Arctic Attack Halftrack, and both the Hero and Enemy versions of the Arctic Quads! And then there’s previous arctic-themed accessory packs with the Arctic Soldier, Snow Soldier, Arctic Commando, and the Enemy Snow Trooper. And if for some crazy reason you don’t have Snow Job or Snow Serpent Kreons, we’ve got you covered. If you’re looking to go big and save, we’re offering the Arctic Attack Pack: all six of the main new sets in a package that not only knocks about $7 off the total, but ships for free! We’re even throwing in one copy each of the two new minifig accessory packs, gratis! So that’s eight sets for one combo price. Please be aware that any additional sets ordered on top of this special package will still incur their normal shipping charges, but even in that case, your shipping total will be minimized by opting for this package. Additionally, any order over $200 (before shipping) that includes the Arctic Attack Pack will earn the buyer a free Arctic Quad, chosen at random from the two versions (although if you buy one, we will almost certainly gift the other version, while supplies last). These blog posts lay out the genesis of each set, detail its features, and explain the limitations of the design - usually based on part availability and the realities of semi-mass production. Some of our other sets can occasionally be seen at our eBay listings, including the VAMP, HAL, and more. Blog posts for the balance of our line are forthcoming, and will be added to this first post accordingly. We have a lot of great stuff planned for the rest of this year and beyond, from multiple eras of the franchise, so if you like what we’ve done so far, you ain’t seen nothin’ yet! We'll also drop teases for upcoming sets and announcements of promotions or sales here as well. Later RAH (’87-ish thru ’94 and beyond)? Recolors/retools (i.e. red or white HISS tanks, Tiger Force, etc)? Customs based on vehicles from fiction (Cobra Sky Crane copter, ATV from ‘Cobra’s Captives’, etc.)? …or based on unproduced prototypes like the Tank Transporter? Geewunner original sets “in the style of” Joe (such as our currently available Ninja Cycle 2pack)? Original recolors/retools (such as an “arctic” AWE Striker in white)? Playsets based on environments from fiction? Thanks for reading, looking forward to your feedback! Here's a sneak peek at March's releases! There are actually two more AT-themed releases this month as well: two color variations of an original 2-pack. It's a combo of retooled & recolored versions of the Ferret and Night Landing. Looking to drop these four sets by the middle of this month. April's two releases will probably debut at the Burbank, CA Joe show on April 6th, and become available online shortly thereafter. been ordering your stuff and love what I got so far. Have the Vamp inbound and can't wait to see how that looks in my hands too. His stuff is top notch. Have the adv. team stuff on the way. Can't wait. Hey Austin, next time, try reaching out to a staff member instead of "waiting patiently". No staff member would actively look out building block threads in the Customs General Discussion Area. Hey, what about me? I sent you a pm asking for my kreo customs, recipes thread to be moved to the building blocks section. No love for Slim, I guess. Sorry, didn't mean to step on anybody's toes. I was just trying to convey that I didn't just rush to post another thread. Before the Kreo subforum was started, Kreo related stuff was scattered in multiple subforums. I waited until the dust seemingly settled on the migration. I'll remove mention of this from the original post. If it helps, the previous thread can be deleted; this one has updated info. So glad you guys are happy with the product. Thanks for the support. We've secured our spot at the Burbank Joe show,and are preparing April's releases, set to debut at the show, as well as ensuring we have as many copies of each and every set in the line are in stock for that event. Can't wait to start teasing out the next two sets, we really think folks are going to love 'em! i've got 2 of your ferrets. makes the new kreo version superfluous. Actually, I did respond. Maybe you didn't see it/get it? As you already reached out to another Admin though, they'll handle your request.